Our bodies function electrically. We all know what happens when the electricity is turned off in our homes or offices. Suddenly we have no appliances, computers or televisions. In fact, in our society without electricity everything stops. Therefore eat food as raw and whole as possible (it’s cheaper too). 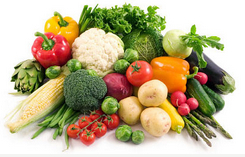 Eat more fresh vegetables, fruit and complex carbohydrates. The Chiropractors at our clinic are trained in assisting you with nutritional advice and give up their time weekly to give informative classes, held at our clinic. It is highly recommended that you attend one of our classes to know more about proper and good nutrition. Attendance is FREE. Ring our clinic as bookings are limited. It could change your life! Eat properly constituted, organic, whole, living foods, a high percentage raw. Only steam vegetables. Remember heat kills enzymes. The ideal balance is 80% alkaline ash / 20% acid ash foods. Most diets today comprise of 90% acid/10% alkaline. Reduce meat in your diet. Any meat consumed should be hormone and pesticide free. White meat is generally better than red. Try to avoid pork. Avoid sugar, dairy, coffee and alcohol. Some broiled fish, deep and cold caught, eaten sparingly is OK.
Keep high glycaemic fruit intake down. Eat more fruits that have low sugar-conversion, such as pears and apples. Eat 6 small meals a day, ensuring that you don’t go hungry and that the body has a constant supply of nutrients. The basic supplement program will consist of plant derived Colloidal Minerals, Vitamins, Essential Fatty Acids, B group Vitamins. Exercise and Stretch to get everything moving and assist in detoxing the body in an oxygen-rich environment. Use safe natural personal care products. Use safe natural household products.